Sadler’s Wells takes to the streets this summer with a dazzling programme of events across London and the UK. As part of our ongoing work bringing dance into the community, we will be hosting and participating in events across numerous outdoor stages, hoping to make the most of the dancing weather. Cally Festival takes over one of Islington’s most iconic streets, Caledonian Road, for a free day of activities celebrating our local neighbourhood. Sadler’s Wells co-hosts the Bus Stop Stage with Urdang, an academy training young people in dance and performance. The programme features performances from Artistry Youth Dance Artistic Director Kamara Gray, the Flying Seagulls and street dance choreographer Neo, as well as the students from Urdang. There will be workshops from our monthly group for young children and adults, Family Fridays, as well as La Escuela de Baile, a flamenco school led by Artistic Director Nuria Garcia. Old Men Grooving joins the Finsbury Park Community Hub as part of the Islington-wide Soul in the City festival. This is a workshop aimed at classic dance lovers, intended to (re)introduce people to their groove via a selection of memorable tunes from the 1950s through to the 1980s. Old Men Grooving – a group of five men aged 40 to 60 brought together by a shared love of dance – have featured on Britain’s Got Talent and live by the ethos that good music never gets old. The Great Get Together is a nationwide event bringing London’s diverse communities together, inspired by the late Jo Cox MP. Sadler’s Wells presents a family-friendly programme of music and dance in London’s Queen Elizabeth Olympic Park, including performances and workshops from hip hop dance powerhouse Breakin’ Convention, Tim Casson’s interactive dance performance The Dance WE Made and a moving female trio by Tavaziva Dance which communicates a universal message about human fragility within our changing world. Our resident weekly dance club for the over-60s takes to the Islington Assembly Hall for a day of activities supported by All Change. Learn how to dance to ska and rocksteady in our rub-a-dub workshop curated by David Hamilton, co-founder of Phoenix Dance Company whose recent show Windrush: Movement of the People played at the Peacock Theatre to critical acclaim. Sadler’s Wells returns to Suffolk’s popular Latitude festival for the eleventh year to showcase dance on the Waterfront Stage. National Youth Dance Company make a pit-stop on their national tour to perform Used To Be Blonde, choreographed by Sadler’s Wells Associate Artist Sharon Eyal, and audiences can see an exclusive preview from Sylvia; an Old Vic, Sadler’s Wells and ZooNation: The Kate Prince Company production, choreographed by Sadler’s Wells Associate Artist Kate Prince and co-commissioned by 14-18 NOW. We’re also looking forward to rising star Jamaal Burkmar‘s new company Extended Play, which will be going back-to-back with Humanhood as a double bill. A free day of fun and entertainment at Here East, celebrating 100 years of women’s suffrage with performances, talks and activities. Open Doors: Vote 100 is the first event devised and delivered in tandem with all of our partners in the recently-announced cultural and education district in Queen Elizabeth Olympic Park: the BBC, UAL’s London College of Fashion, V&A, Smithsonian Institution and UCL. Expect a diverse programme of film and music, dance and poetry, displays and debate. 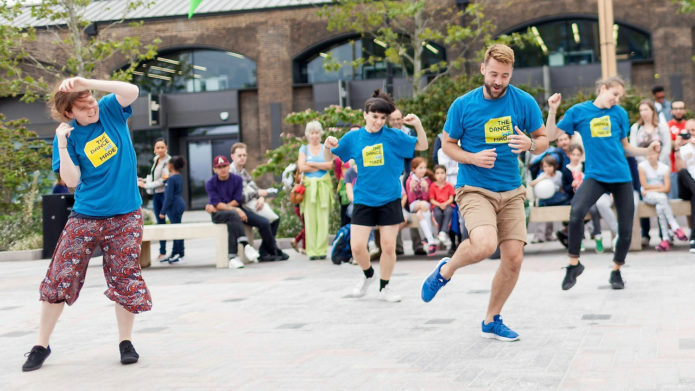 Throughout the summer, the National Theatre’s River Stage hosts a series of takeovers from companies across the spectrum of the arts, including music, theatre, film, circus and dance. Our turn at the helm is a weekend dedicated to dance in all its forms. Breakin’ Convention – the award-winning and critically acclaimed hip hop dance powerhouse that celebrated its 15th anniversary this year – open on Friday night with Freestyle Funk Forum, an hour of improvised theatre that’s hip hop’s answer to ‘Whose Line Is It Anyway?’. Step Change Studios will be showcasing ballroom dance by disabled and non-disabled dancers, and visitors can take part in family-friendly sessions including flamenco, Lindy hop and a ceilidh. Vidya Patel and Shammi Pithia present their new work Converse for the first time and Dotdotdot Dance, the UK-based flamenco dance company co-founded in 2014 by Magdalena Mannion, Noemí Luz and Yinka Esi Graves, presents live music and a variety of works including When Viola Met Margas and Into Being. More information and a full line-up can be found on the National Theatre’s website. Sadler’s Wells returns to the eclectic Wilderness Festival in Oxfordshire with a pick of dance acts, including Janine Harrington’s playful and interactive dance-puzzle STACK and Hofesh Shechter’s lauded Clowns, performed by Shechter’s new junior company Shechter II. Photo credit: Casson & Friends, The Dance WE Made. 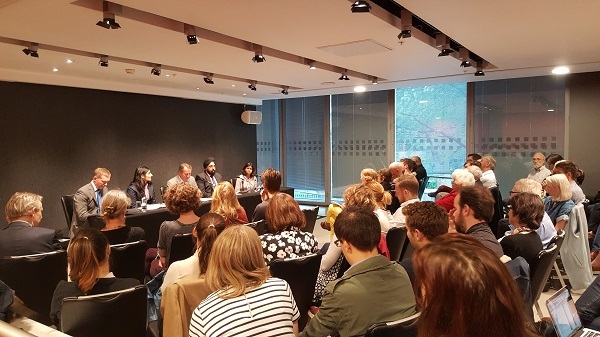 In the run up to the EU referendum on 23 June, we invited four high-profile speakers to make their case in a public debate at Sadler’s Wells on 23 May. Former Deputy Mayor for Culture Munira Mirza and Dr Peter Chadha, Deputy Chairman of Business for Britain, London, argued for Brexit, while Shadow Leader of the House of Commons Chris Bryant MP and barrister and Women’s Equality Party candidate Harini Iyengar explained why they believe the UK is stronger in the EU. The free event – moderated by Financial Times commentator and Chatham House fellow Quentin Peel and attended by nearly 100 people – gave the audience an opportunity to hear arguments both in support of and against British membership of the EU, and ask questions to the panellists on the impact of a potential Brexit on issues such as trade, immigration and the arts.